Punjab Grill is hosting a special food festival called ‘Rangla Punjab’ to celebrate ‘Punjab’ at its Select Citywalk outlet, from 10th February to 24th February. I was recently invited to taste the delicacies on offer and was amazed to see the efforts put in by the Head Chef Gurpreet Singh to take you to the journey of Punjabi food beyond butter chicken and dal makhni. We were greeted with a popular Punjabi drink Kanji which is also a regular feat at my home, during winters. ‘Kaali gajar’ mixed with mustard seeds and heeng, along with the water is kept in a glass martaban under the sun and allowed to ferment for a couple of days. The result is a tangy and richly flavoured drink. At Punjab Grill, the Kaanji was served in a clay cup garnished with carrots. I relished every sip of it, intermittently eating the kaali gajar. In the starters, I had ‘Macchi de Pakode’, river sole coated with ajwain mixed gram flour batter and later, deep fried. The accompaniments with the starters were Gobhi Shalgam da achaar, meat da achaar – both lamb and chicken. The meat pickles were rightfully chewy, that helped us juice out the real flavors of the meat and the spices that coat them. Oh, I wish I could bottle up some of that pickle and savour it day and night! The highlight of the Rangla Punjab food fest is ‘Kotkapure da atta chicken’, a dish inspired from a small city in Punjab. First, the chicken is marinated in almonds, black pepper and other light flavoured spices. Second, the marinated chicken is put inside a tightly knotted muslin cloth. Third, the chicken is sealed with the wheat dough and placed in tandoor for a couple of hours. I pine to find the same treat on the streets of Delhi. Aromas simply bust into the rook as the muslin cloth was unknotted. The flavor of the spices, apparently, was compact in the chicken thus making the dish richly delightful. It was interesting to watch the chef, adorning hand gloves, holding a fork and knife, artfully slicing the wheat dough. 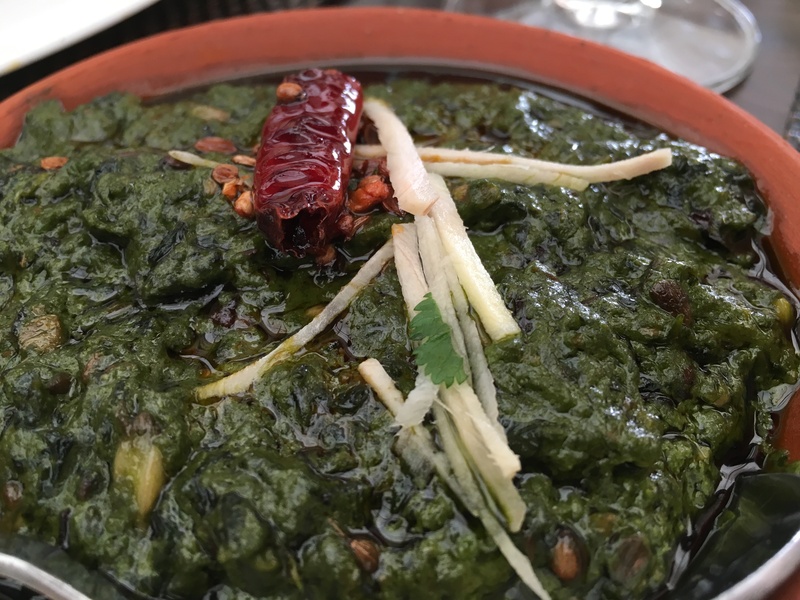 Another outstanding dish, though in the vegetarian menu, is makke di roti and sarson da saag. It was simply exotic! It was served in a clay container, giving it an earthy aroma, with ghee floating gleefully on top, and garnished with coriander seeds, whole red chillies, thus adding to the flavour. The saag was accompanied white butter, for that divine touch. Being a Punjabi, I enjoyed the dish immensely. Another significant dish, in the vegetarian menu is dal. Laden with ghee, the dish looked tempting and was purely delectable. The feast ended on a sweet note with gud wale chawal, cooked in ghee with dry fruits, and makhane ke kheer. If you wish to spice up your life with some authentic Punjabi tadka, I’d recommend you visit this festival and savour the mouthwatering delicacies at the earliest!